“It's a lonely walk if you're a rejected soul, alone and nothing makes you whole. Rejection comes from family, friends, loved ones too, breaking the heart...through and through.” ~ Barbara Kasey SmithNo one should be rejected for trying to be who they are, yet it happens all the time. 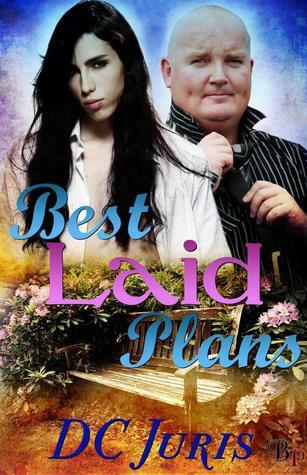 Kale, in 'Best Laid Plans' by DC Juris, is so ostracized for being transgender, that he feels compelled to leave everybody and everything behind and make a new life for himself. Being young and inexperienced, he has no idea just how difficult that will be.Kale is a sweet person who is only trying to be himself. Being idealistic and impulsive, he made his first mistake by giving up what he had to spite his family, but I was furious at them, first for judging him because he wasn't what they wanted him to be, and, second, because they were more worried about appearances than how he felt. If anything, their child needed even more support than usual. They should have been applauding his bravery and independence, not condemning him. Instead of being insulted, they should have been proud that he was so secure that he could take this gigantic step toward being true to himself. Their lack of support backed Kale into a virtual corner and he came out fighting by leaving, putting himself into even more jeopardy. Not that the bad decisions he makes are their fault, per se, but they certainly didn't give him the love and guidance he needed in order to make more logical, safer choices. When things settle down, Kale is stuck in a never ending cycle; he can't make it where he is and he can't go back. By chance, he meets Perry which gives him an option, although an unsavory and potentially dangerous one.In many ways, Perry is just as lonely and feeling rejected as Kale is. He's definitely not lucky in love, having had several failed relationships, including a one-night stand with a woman which ended up producing a child. The night Perry propositions Kale, he is looking for more than instant gratification, he just doesn't know it yet. He and Kale feel something for each other right from that first night. He knows he wants to see Kale again. Kale comes to realize that none of the other men feel like Perry. They begin their convoluted dance of a very unconventional relationship. Neither understanding themselves, much less each other, they fall into a pattern of doubt and mistrust, which only begets more lies and indecisions. It's not an easy road for them and they have major stumbles in their path to understanding.The Transgender issue is something that weighs heavily on my soul because it's an issue I want and need to understand for personal reasons. DC presents it in such a passionate, direct way that it cuts through all the so-called unnaturalness of it, exposing the simplicity and wholeness that lies underneath. Nature may have made a mistake, but underneath, is still the true person, a beautiful butterfly just waiting to emerge and show their true self to the world. I recommend this to everyone who wants a better understanding of what it means to be transgender along with a reminder that it's what's inside that counts and we have no right to judge. Thanks, DC, for the beautiful message of love and understanding which has had a profound impact on my heart.NOTE: This book was provided by Torquere Press for the purpose of a review on Rainbow Book Reviews. When I saw this book cover I really thought..what the?? that cover is not appealing at all, but once I started reading the story I understood the cover and at the end I really like it.Not very fond of this kind of plots (prostitutes), but I found this story very nice and sad at the same time, very lovely indeed. I really enjoyed the story and fell in love with the characters. Perry was incredibly sweet and appealing, and Kale was the perfect match for him. This was my first book by DC Juris, and I will definitely be looking into more titles by this author.